is about 200,000 people larger than yesterday. The world population clock LIVE shows you in real time how fast it’s actually going. This development will put enormous pressure on Earth’s resources and we’ll need to find more sustainable ways of living. And fast! By 2025, world population will be over 8 billion people. 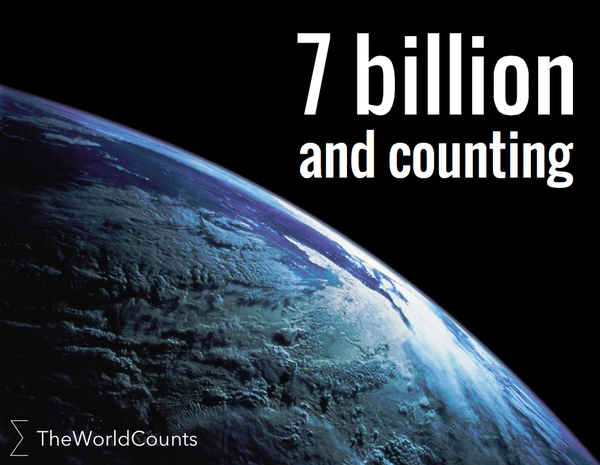 Around 2040 it could hit 9 billion and by 2100 it could reach a massive 11 billion people. If we don’t start radically changing the way we consume the planet, we will be heading for a complete collapse of our consumer society. At current trends, the planet cannot sustain twice as many people and a 26 times larger economy. There is a need for a new industrial revolution where economic wealth goes hand-in-hand with environmental and social sustainability. And fast. We are reaching critical tipping points beyond which it will be too late to reverse negative trends. The current world population of 7.2 billion is projected to increase by 1 billion over the next 12 years and reach 9.6 billion by 2050, according to a United Nations report launched today, which points out that growth will be mainly in developing countries, with more than half in Africa. Interested in more facts like the world population? Then plug in and subscribe to our newsletter.